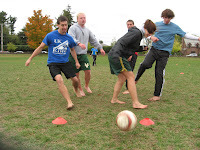 On Sunday, October 14th, the University of Vermont (UVM) hosted a “Lose the Shoes” barefoot soccer tournament and fundraiser for “Futbol para la Vida”, Libertad’s HIV prevention education program in the Dominican Republic. 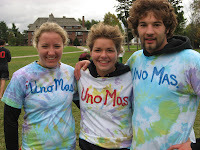 Although temperatures we’re in the low 40s, more than 100 UVM student’s turned out to play. 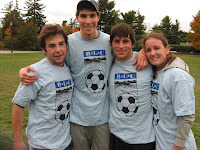 FPV is part of the international Grassroot Soccer network, and “Lose the Shoes” tournaments occur throughout a network of U.S. colleges and universities in support of Grassroot Soccer and affiliated programs through the College Kick AIDS Campaign. This Fall’s tournament was organized by the November ’07 UVM travel-study course to Batey Libertad. 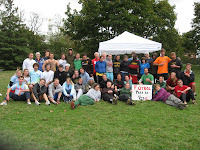 Twenty-five teams competed in a 3 v. 3 format on the green of Redstone Campus, with prizes and raffle items donated by local Vermont businesses. For more information on this event, or to help with planning future UVM soccer fundraisers, please get in touch with tournament organizer Lena Forman at lena.forman@uvm.edu. Thanks Lena for an awesome event!